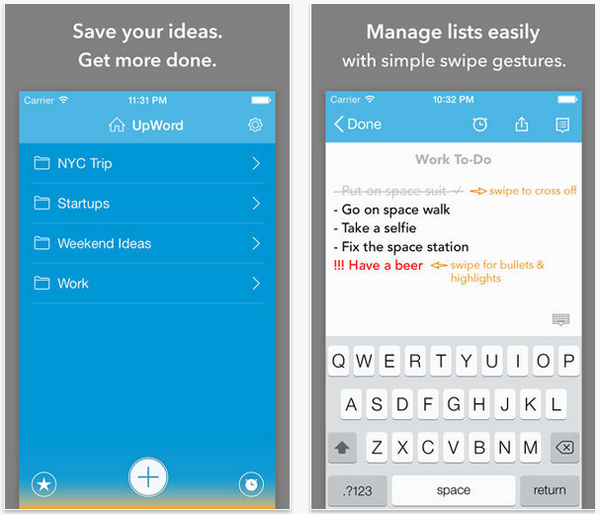 If you still haven’t clicked with a to-do list app and just know that having one by your side will make you 985835 times more productive, then we might have just the solution: UpWord Notes. The to-do list app that launched late last month is very similar to another of our favourites, Clear, but it’s not as sparse with a bunch of added features that we now just can’t live without, including reminders, favourite tasks, text customisation, link mode and much much more. The way it IS the same as Clear is the bit we like the best: intuitive gestures that allow you to move between folders and lists with ease. UpWord is just more beefed up, and we hate to say it Clear, but more realistic for those with multiple day-to-day tasks that can’t just be reduced down into a few neat lists. At the moment UpWord Notes is only 69p in the app store, so get it fast as it’s usually double the price.